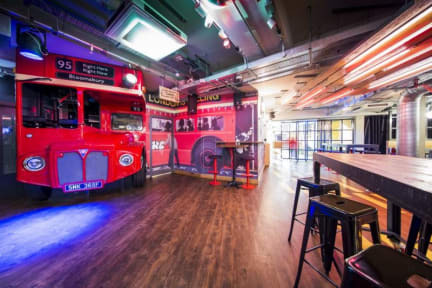 Hostelworld guests have said Generator Hostel London is a clean, secure, 'well-organised hostel with good and professional staff'. We like their 'lively and atmospheric' bar, which travellers tell us is 'a great place to hang out a bit and have a beer while meeting nice people from around the globe'. 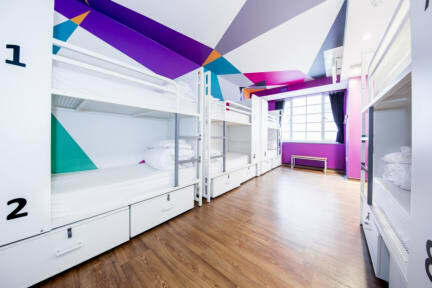 Our users say this hostel is 'only three minutes' walk to Russell [Square] Underground Station, six minutes to King's Cross Station [and] three minutes to buses'. Everything was super clean and tidy, great location and boss staff. Very helpful and informative, the atmosphere was amazing especially down in the down stairs pub. It was a pleasant place to stay would definitely revisit. Great facilities, pretty comfy beds, good atmosphere and a fantastic location. Shower stalls are very small and if you’re a tall person you’ll have a hard time fitting under the shower head, but overall would recommend. Fantastic location, nearest tube 2 minute walk away, and straight onto the Piccadilly line. we visited London for the first time with our children aged 7&9, we had a great time, it was also our first time in a hostel. The kids loved the hostel, it was young and trendy with plenty going on. the atmosphere was great and they loved the breakfast with nutella on tap, literally! The area felt clean and safe which was a definite plus with the kids. Great location, clean and cheap. Only critique would be that the bathrooms need some upgrading. Also, the bathrooms need to be cleaned more often. Aside from the bathroom, the hostel has a great atmosphere. Keep your cellphones in your pockets when walking from the underground Russell station to the hostel, my friend had his cell stolen from out of his hand by two cyclists. Was not happy with pad lock which only came with one key. The room was not at all as it was portrayed in the pictures. It was really small, dark and with no facilities but the beds. The shared bathrooms are really bad organised: how can you put just one hair dryer per floor?! Moreover, the showers are few, really small, dark and without shelves where to place your stuff. In our floor one sink was broken and the only hair dryer was broken as well. The cleanliness of the building leaves much to be desired. Too expensive for what it offers.